The power the papacy grows and reaches its apex due to removal of older reigimes. Barbarian powers such as Lombards supplanted older emperors and took on different roles w.r.t. culture and faith. In the vicissitudes of state powers exchanged, the Church grew its authorities on faith as it took opportune moments assert its independence. However, authority wasn’t simply the command of the word but also a militaristic one (“Just war”) in the so-called defense of the institution. Ultimately, the great schism between east and western churches was the refusal of the former to submit to such an authority. The argument is a play on language where existence is used as a predicate. Scholasticism culminated with the works of Saint Thomas Aquinas whose beliefs on the nature of God followed the metaphysics of Aristotle. God as actus puras (pure act) is identical with his essence which necessitates his existence; this is analogous to fusing both the Aristolean form and matter in their relation of potentiality and actuality. The existence of God follows from Aristotle’s “unmoved mover” or prime mover / first cause. Last, Thomas asserts that truth is derived from two sources: Natural reason or the logic of man from first principles is the first source. Divine reason or revelation by the grace of God is the second source. Moreover, the two bodies of knowledge derived from these sources can coexist (non-contradictory); this protected the many creeds issued by the Church in a retroactive sense. 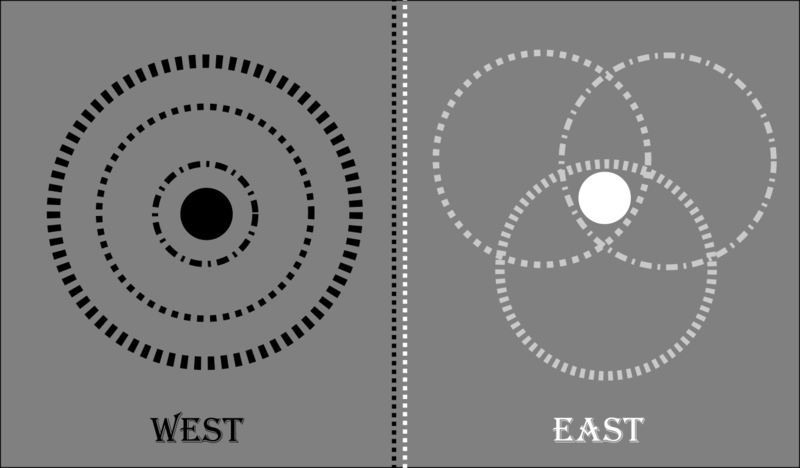 Outside of issue of papal authority, the great schism between Eastern and Western churches disagreed on the nature of the trinity of God. From the works of Aquinas, the Western church’s holy trinity (father, son, holy-spirit) belong to the essence of God and are all inter-related but impersonal; each Person is not an treated as an individual per-se but are distinguished via relations with one another. I liken the Father to the universal form of all ideas, the Son as God’s awareness of the forms (self-knowledge) through will/intellect, and the Holy-spirit as an archetypal conscience that is derived from a tension between universals and particulars. The Eastern church disagrees as they center the God head on the Father (personal) as the sole originator of both the Son and the Holy-spirit. The end of the middle ages is marked by the rejection of universals and the regularization of concepts. William Ockham was a major proponent of this Nominalist movement by asserting that universals didn’t exist but are abstractions via intellect (bottom-up organization); universals are merely words. Ockham’s razor posited that entities should not be multiplied beyond necessity which is to say that solutions or explanations should be parsimonious or as simple as possible. Such a constraint will have a power effect on the enlightenment period where older assumptions are discarded/culled away and the scientific method for acquiring knowledge on nature can advance (in increments).